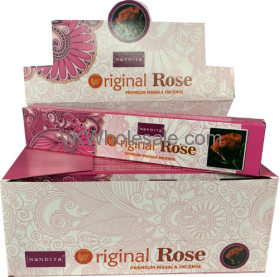 Minimum quantity for "Original Rose Nandita Incense 12 PK" is 1. 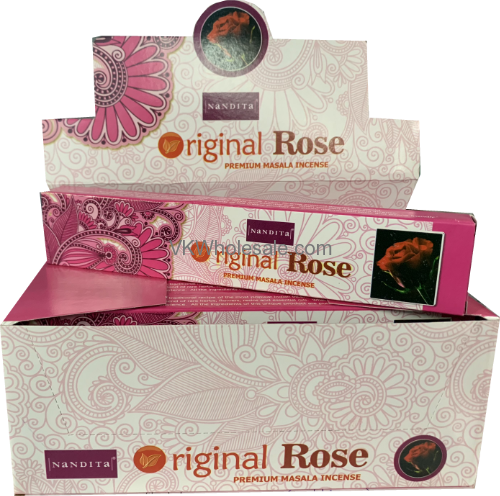 Original Rose Nandita Incense - premium masala Incense is the true traditional recipe of the most popular Indian incense enjoyed and used around the world. Nandita incense gives you unique blend of rare herbs, flowers, resins and essential oils. When you light a Nandita incense, you assure yourself a safe and natural experience. All the ingredients of this natural products are purely organic, non toxic and ozone friendly. Each box contains 12 individual boxes, Each individual boxes contains 12 Nandita incense sticks. Minimum quantity for "Angel Love Nandita Incense 12 PK" is 1. Minimum quantity for "Aura Cleansing Nandita Incense 12 PK" is 1. Minimum quantity for "Climaxxx Nandita Incense 12 PK" is 1. Minimum quantity for "Floral Valley Nandita Incense 12 PK" is 1. Minimum quantity for "Fortuna Nandita Incense 12 PK" is 1. Minimum quantity for "Frank Nandita Incense 12 PK" is 1.